Remember in Surah al-Baqarah, part 2, when I mentioned the migration of Muslims from Mecca to Medina? Well, as with any refugees, they had to leave much of their proptery behind them in order to escape hostile attention from their persecutors. This property was presumably seized and redistributed by Muhammad’s own tribe, the polytheist Qurayshi who administered Mecca. Now, Medina is not too far from Mecca or its caravan routes. Once the Muslims settled in Medina, they started organizing raids on the caravans that fueled Mecca’s economy. Muslims justify these raids in many ways: it recompensed the refugees for their lost property, destabilized Meccan economy, provided enemy intel, and was reactive to Meccan threats. The Battle of Badr was the first official battle between the Meccans and Muhammad’s followers based in Medina. It was not an act of conquest but it was a raid gone-wrong-gone-right. A caravan, bound for Mecca, was coming fresh with goods and money from trading in Syria. There was an oasis named Badr that the caravan was to travel by, and so Muhammad and roughly 300 men journeyed there to intercept and plunder. Medina to the north, Mecca to the south. Badr is an oasis within the hills and convenient to caravans. The caravan leaders became savvy to this danger and redirected their route, sending messengers ahead to Mecca asking for military support. The Muslims at the oasis happened upon some reconnaissance alerting them that, rather than a caravan from the north, a hasty posse of 1000 Meccan soldiers was coming towards them from the south. Prepped with this knowledge, Muhammad and his troops prepared a strategy and surprised the Meccans with their readiness. By all accounts, it was a stunning victory for the Muslim raiders, despite being outnumbered three to one. This victory was so affirming that Muslim historians compiled a complete list of the Muslim soldiers present, and traditionally Muslims will recite those names with honorific blessings. About a year after Badr, the Meccans assembled a formal army against the Muslims. Since the Muslims were in Medina’s walls, the army pillaged the farms and settlements around Medina, working their way around to the northern side. At first, Muhammad intended to stay in Medina, where the walls provided defense, but eventually it was decided that they could build a strategy utilizing Mount Uhud to the city’s north-east. I do not know how the modern city compares to the original city, now that infrastructure is centered around Muhammad’s tomb (green arrow). The red arrow points to the Mosque of Two Qiblas, from Surah al-Baqarah. The yellow arrow points to Mount Uhud. The blue arrow points to where tradition says the battle took place. Note that there is a road loop encircling the battle site. This second battle, Battle of Uhud, would be a big failure for the Muslims. Some troops abandoned Muhammad before the battle, limiting Muhammad’s army to 700 men, but still the remaining group went forward. There were 3000 Meccans, mounted on camels and horses, but Badr had inspired confidence in the Muslims. At first their strategy worked, with archers defending the troops from the higher ground of a hill on site. Then, when the battle looked favorable for the Muslims, the archers left their post on the hill in order to plunder the Meccan camp. Without the archers’ defense, Mecca’s cavalry was able to sweep in from behind and destroyed the Muslims’ formation. Muhammad himself was badly wounded and had to be harbored in a cave for safety. The Meccans were then satisfied with this victory and went home. And lo! We come across predestination! Predestination theology has two extremes: one where men operate purely by free will and happenstance, the other where all action is pre-authored by God. Predestination in Islam is called qadar (“fate”), and my impression from the blog posts and the history I have read is that mainstream Islamic theology emphasizes God’s authorship. Qadar’s application here is that the men who died were destined to die. Whether the survivors had stayed at home or whether another battle plan had been tried, those men would have still “gone out” to meet their deaths. It is not clear to me whether they would have died in the same way, or whether the death could have been a different kind of death. The point is that the believers should not question or regret their choices, as God had already predestined the death of the fallen soldiers. Indeed, it is strongly emphasized that men may only die if God destines it. While that application of qadar is intended to rebuke mutinous thoughts (and perhaps assuage survivor’s guilt), it cannot help but invoke the questions of predestination theology. If the men’s choices would have made no difference in the outcome, does human choice matter? If those men were destined to die, why is this loss the fault of men who left their posts to plunder? Would not those men have died regardless, as God is now declaring? What else was fixed by God? Their loss of the battle? Did they make those choices, or did they just experience God’s choices? Can God rightly judge them for doing something He destined them to do? This loss is framed as a test from God, to make evident through action the truth of people’s hearts. However, unlike the change in Qibla which provided Muhammad with clear insight into exactly which men were most unquestioning, I am not sure what evidence concerning the faithfulness of the followers is supposed to be gleaned. The troops who abandoned Muhammad before the fighting come back later and are forgiven. That they are forgiven is a merciful thing, but now Muhammad must ask whether he can depend on them in the future. The men who die seem to be acclaimed martyrs, but is it possible that some were killed as a punishment? And how do you know who among the survivors are guilty or innocent, repentant or resentful? Some of the men fall into easy sleep while others remain fitful and grumbling, but given the physical and psychological effects of a battle, how much can you judge a conscience by restfulness? While God asserts that He knows, Muhammad and the men are left with inconclusive evidence to discern whose guilt is dragging down the group’s religious purity. One ayah mentions some men longing for martyrdom before the fight, then states “now you have seen it.” That response intrigues me because its meaning changes depending on the tone with which you read it. It might reflect upon their vain idealism crushed by harsh reality. It might rebuke the hypocrisy or note the irony that men who praised martyrdom should whine when men actually die. It might challenge their willpower to see death and still long for martyrdom. Martyrdom is not set apart as preferable to a normal death, just to be clear, but to die any death as a believer is the ultimate goal. In all religions I have examined, martyrdom is seen as the most secure way to die, since the death happens while the martyr is acting in belief. In this battle, the men who have died are proclaimed martyrs. God mentions going through the men and selecting those strong enough to be martyrs. They are described as being in Paradise, enjoying vindication that their faith was in something real. After this loss, the Muslims are enjoined to hold onto their faith even stronger, or else their loss means nothing. If the faith isn’t true, then that means the dead aren’t in Paradise receiving their reward. The tragic loss of life for religion would have no redemption and the survivors would be left in true mourning. (This message is very prominent in Christian scriptures too.) I worry that religions utilize this emotional desperation too much. At some point people stop evaluating whether something is true because they emotionally need it to be true in order to feel good about what they have invested in their religion. Consider what it means for a practicing Mormon to give up their beliefs. They likely have to count for naught their 2+ years of life on church missions, 10%+ income tithed to the church, personal time in religious activities, and all the experiences they denied themselves for the sake of purity. Mormonism is easy for me to target as I’ve witnessed the sacrifices of many good Mormon friends, but this happens in all religions. The more aware we are of what something has cost us, the more likely we are to psychologically value that thing. I worry that it keeps many people from honestly evaluating what and how they think. And all these arguments, admonishments, and instructions worked. The Muslims regrouped, kept their trust in Muhammad’s authority, extended their numbers through alliance and conversion, and solidified their identity and faith. Within two years, they leveraged from the Quraysh the right to pilgrimage to Ka’ba in Mecca. Within five years, 10,000 Muslims and allies marched without much resistance into the city and purged its polytheism. 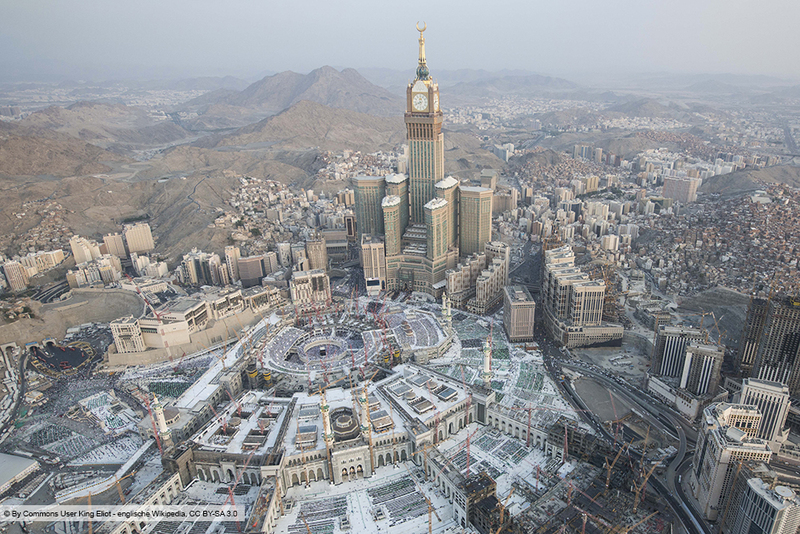 Today, only Muslims can enter Mecca, and every year the pilgrims burst open its seams. The Quraysh didn’t know what they were missing out on. Perhaps you were wondering, as you read all of this, “So who is this Imran?” After all, the surah is titled after his family. There was a lot to cover about the crisis of Uhud, and much of the surah tied into it, but next week I’ll only examine the other threads that did not weave so tightly into this narrative. There is still so much to cover!